WASHINGTON (Reuters) - It was the start of something big - really big. Scientists on Thursday said they have found a fossil from 163 million years ago that represents the oldest known example of a lineage of advanced flying reptiles that later would culminate in the largest flying creatures in Earth's history. The newly identified Jurassic period creature, a species named Kryptodrakon progenitor that was unearthed in the Gobi desert in northwestern China, was modest in size, with a wingspan of perhaps 4-1/2 feet (1.3 meters). But later members of its branch of the flying reptiles known as pterosaurs were truly colossal, including Quetzalcoatlus, whose wingspan of about 35 feet was roughly the same as that of an F-16 fighter. Roughly 220 million years ago, pterosaurs became the first flying vertebrates to appear on Earth, with birds - first appearing about 150 million years ago - and bats - appearing about 50 million years ago - coming much later. Pterosaurs arose during the Triassic period not long after their cousins, the dinosaurs, also made their debut. Their wings were supported by an incredibly elongated fourth digit of the hand - the "pinky finger." The pterosaurs remained largely unchanged for tens of millions of years - with characteristics like long tails and relatively small heads - and none became very big. But later during the Jurassic period, some developed anatomical changes that heralded the arrival of a new branch called pterodactyloids that eventually replaced the more primitive forms of pterosaurs. Many of these pterodactyloids had massive, elongated heads topped with huge crests, lost their teeth and grew to huge sizes. 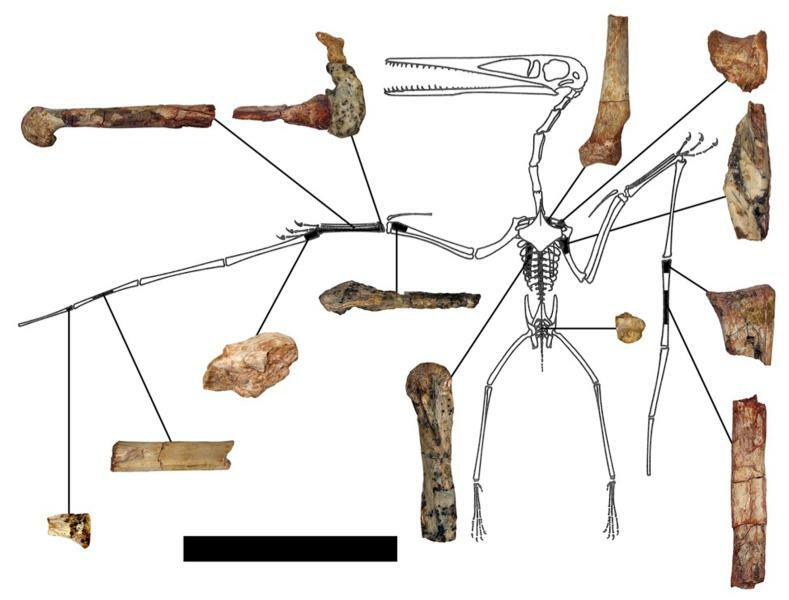 Perhaps the defining characteristic of the group is an elongation in the bone at the base of the fourth finger called the fourth metacarpal, and Kryptodrakon is the oldest known pterosaur to have this advance, the researchers said. "In primitive pterosaurs, it is one of the shortest and least variable bones in the wing, but in pterodactyloids it is quite elongated," said Brian Andres, a paleontologist at the University of South Florida, and one of the researchers. Kryptodrakon lived right before its fellow pterodactyloids began to take over the ancient skies. "We can look at his anatomy and see what were the last changes in his body that may be responsible for the success of the group," Andres added. Another important element of the discovery is the environment that Kryptodrakon called home. It lived in a river-dominated ecosystem far from the ocean in a region teeming with life, including a fearsome dinosaur predator called Sinraptor and a gigantic plant-eating dinosaur named Mamenchisaurus that boasted one of the longest necks of any creature ever to walk the planet. George Washington University paleontologist James Clark said the fact that Kryptodrakon lived in such an ecosystem along with other evidence indicates that the advanced pterosaurs - many of which later ruled the skies over seashore ecosystems and fed on fish in the oceans - actually first evolved far inland in a terrestrial environment. The origin of the pterodactyloids had been a little bit of a quandary, with their fossil record not extending back in time as much as some scientists had expected. Kryptodrakon is about five million years older than any other known member of the advanced pterosaur lineage, the researchers said. "This is filling in that time gap," Clark said. Its genus name, Kryptodrakon, means "hidden dragon" in honor of the 2000 film "Crouching Tiger, Hidden Dragon," that had parts filmed near where it was unearthed. Its species name, progenitor, means ancestral. The research was published in the journal Current Biology.